The WSU‑led and USDA‑funded Northwest Advanced Renewables Alliance is making alternative jet fuel from forest products. PULLMAN, Wash. – Washington State University ranked No. 1 for the second year in a row in U.S. Department of Agriculture (USDA) research and development expenditures. In the 2017 federal fiscal year, the latest period for which complete figures are available, WSU researchers spent $50.9 million of the USDA research and development funding committed to the university, leading more than 375 universities nationwide, according to the National Science Foundation’s Higher Education Research and Development Survey. The expenditures also set a university record, increasing by $8 million over last year’s previous record. 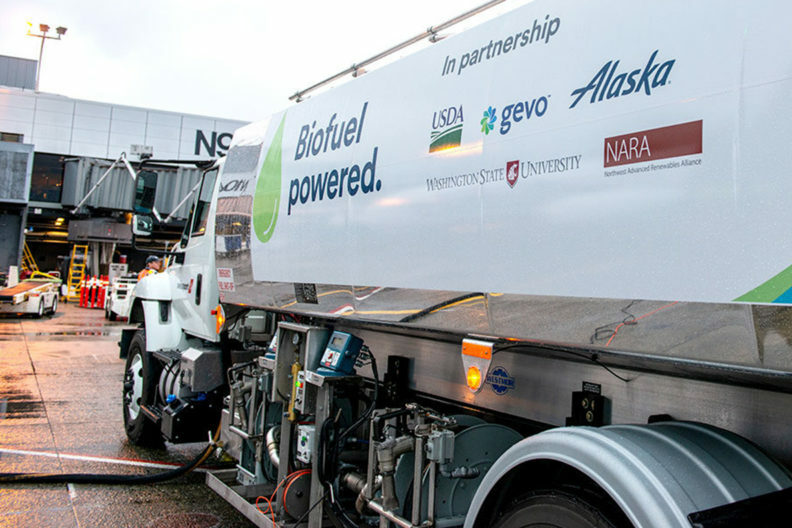 The Northwest Advanced Renewables Alliance – or NARA – research to use forest residuals to create bio‑based alternatives to petroleum‑based jet fuel. Seattle‑based Alaska Air was the first commercial airline to fly with this kind of biojet fuel in November 2016. A National Institute of Food and Agriculture food safety initiative on integrating biology, psychology and ecology to mitigate antibiotic resistance in food animal production systems. The project used dairy systems to serve as a model for other animal production systems. A National Institute of Food and Agriculture specialty crop initiative to reduce the impact of insect and disease problems in hops through the development of preventive and predictive strategies. Washington state’s Yakima Valley is home to one of the most fertile and productive hop growing regions in the world. Tracking the actual expenditure of USDA‑sponsored research funds is considered the most consistent measure of externally‑driven research support for a research university. The USDA is the largest funder of agricultural and natural resource research and development at U.S. academic institutions. The USDA aims to meet the needs of farmers and ranchers, promote agricultural trade and production, work to assure food safety, protect natural resources, foster rural communities and end hunger in the U.S. and internationally. “We are excited to top the list of USDA expenditures for a second year in a row. WSU’s partnership with the USDA advances agricultural research, development, and innovation, helping to power our state and national economy,” said Christopher J. Keane, vice president for research at WSU. WSU’s College of Agricultural, Human, and Natural Resource Sciences (CAHNRS) expended nearly 76 percent of the USDA research dollars as reported by the NSF. WSU College of Veterinary Medicine expended nearly 12 percent of USDA funding, conducting research focused on livestock health and food security. WSU’s Voiland College of Engineering and Architecture (VCEA) also expended USDA funds, including research in the use of renewable biomass material from the region’s fields and forests to develop bio‑products and biofuels. In addition, a number of other WSU colleges and support units spent USDA funds. “As a key research partner with the USDA, we’re proud to make discoveries that benefit growers, consumers, our economy, and the natural environment,” said André‑Denis Wright, dean of CAHNRS. In fiscal year 2017, CAHNRS had a diverse portfolio of USDA‑funded programs. The programs include providing testing and pathogen‑free material to support the region’s multi‑billion dollar fruit tree, wine grape, and hops industries; the creation of the Genome Database for Rosaceae (GDR), which allows scientists to access and explore Rosaceae genetics, genomics, and breeding data through a suite of integrated data mining tools, speeding up research into better crops and stronger, healthier plants; reducing Bovine Respiratory Disease complex in beef and dairy cattle by finding genetic markers for resistance; and establishing the knowledge base and resources to grow organic quinoa in the U.S., by making it resistant to heat, insects and disease pressure. As the top project expending the most USDA funds at WSU, NARA developed technologies, resources and analyses for turning biomass from forest residuals, such as tree limbs and branches that remain after a forest harvest, into bio‑based alternatives to petroleum‑based products such as jet fuel. Led by researchers from both WSU’s VCEA and CAHNRS, the project included researchers from eight departments and research units across three colleges on two campuses. NARA was comprised of 32 partners from the biofuels and aviation industries, forest sector, public universities, and government laboratories, the project focused on reducing fossil fuel use and greenhouse gas emissions, as well as bolstered sustainable economic‑development potential in timber‑based rural communities located throughout the Pacific Northwest. The five‑year project, which ended in 2017, was supported by the USDA National Institute of Food and Agriculture (USDA‑NIFA). The USDA’s Agricultural Research Service (USDA‑ARS) funds more than 800 research projects annually at nearly 100 research locations, many of them jointly operated by universities. At WSU, unlike most research sites, USDA‑ARS scientists work side‑by‑side with WSU faculty in labs on campus. The Animal Disease Research Unit, a unit within USDA‑ARS, searches for solutions to infectious diseases that inflict devastating livestock losses worldwide. The lab specializes in vector‑borne diseases and is currently developing new methods to prevent the spread of diseases carried by ticks. Late last year, Congress approved the 2018 Farm Bill. President Donald Trump signed the bill on December 20, 2018. The bill could bring millions of additional dollars to WSU for a wide range of programs benefiting Washington state agriculture stakeholders and underserved communities. The $867 billion Farm Bill includes authorization for money to support agriculture research and trade, food and nutrition programs, conservation, support for America’s farmers and rural economies, and animal disease prevention.